Uflex’s Packaging Films Division’s products range from Biaxially Oriented Polyethylene Terepthalate (BOPET) Films "F L E X P E T", Biaxially Oriented Polypropylene (BOPP) Films "F L E X O P P", Cast Polypropylene (CPP) Films "F L E X C P P", Metallised BOPP, BOPET & CPP Films "F L E X M E T P R O T E C T", Special Effects Films, AIOx Coated Films. Uflex’s Packaging Films Division’s products range from Packaging Films. BIAXIALLY ORIENTED POLYETHYLENE TEREPTHALATE (BOPET) FILMS "F L E X P E T"
Our Packaging Films Business produces 3, 00,000 TPA of BOPET films on its ten State-of-the-art lines. These films come in thickness range of 6.5 – 75 microns and are available in plain, surface treated, chemically coated, matte, heat sealable, metallisable, green, clear and extra clear varieties. Green PET films (containing 30% of Green Input): Mono-Ethylene Glycol (MEG) constitutes 30% of the input Polyethylene Terephthalate (PET) resin from which our BOPET films are made. In Green PET films, conventional MEG that is made from scarce non-renewable petro based feedstock has been totally replaced by green MEG that is sourced from bio-ethanol made from renewable agro inputs. Green PET films are approved for direct food contact by the US Food and Drug Administration (USFDA) and European Union Authorities and have the same properties as conventional BOPET films. This is world’s first green polyester product that has won several international awards for sustainability. Down-gauged Conversion Substrates: We have developed world’s first 6.5 micron BOPET film that is suitable for printing and lamination. These run at the same speeds during conversion as conventional higher thickness films and provide significant source reduction ranging from 33to 47%. They have much lower carbon footprint than the films they replace. Bio & Oxo Degradable BOPET Films: To support our sustainability drives, we have developed various grades of Bio & Oxo Degradable BOPET films. Universal Coated PET Films: Converters normally use 7 or 8 different customized coated films for operations like printing, laminating, metallization, extrusion coating/ lamination) or subsequent end-user processing conditions like dry filling, liquid filling, hot filling, pasteurizing / sterilization, retorting, frozen storage, boiling, microwave heating/ cooking etc. to achieve and retain adequate bond strength. Our Universal Coated film is a single drop-in replacement for all the different coated grades doing away with the complexity and costs of stocking and managing multiple input film substrates. It also provides higher bond strength. Antimony-free PET Films: Conventional PET products have a residual antimony content which is minute but nevertheless a concern for packaging liquid products like drinking water and fruit juices. This variant of the film has no antimony content whatsoever. Antistatic PET Film for Twist Wrapping: This film has excellent twist wrapping operations. It delivers 50% higher packing speeds than cellophane and more than double of those obtained from Poly Vinyl Chloride (PVC films) besides being much more environment friendly. Direct Extrusion Coatable PET Film: Can be directly used for extrusion coating and lamination without priming thus simplifying machine design and substantially reducing operational costs. Special Heat-sealable PET Films: One side of this printable film is specially modified to seal to itself, Amorphous Polyethylene Terephthalate (APET) and Crystalline PET (CPET) over a wide sealing temperature range with high heat-seal strength. Coloured Metallised PET Film: This is a high barrier metallised film that comes with a special customized overall background for special market requirements. White PET Films: PET film with excellent opacity in various thickness ranges suitable for lids, labels & surface printing where white background is required. Isotropic PET film: This is prepared from special isotropic resin, ideal for lidding application in dairy products especially yoghurt cups. Extrusion Coatable BOPP Films: These are suitable for direct extrusion coating and extrusion lamination operations without priming. Direct Embossable PET Film: This film is co-extruded with a special surface layer that can be embossed directly without any off-line coating, an expensive process. The embossing can be carried out at lower temperatures (lower energy costs) and leaves deep and sharp impressions. This surface can be metallised with excellent metal adhesion and is ideal for holographic applications. BIAXIALLY ORIENTED POLYPROPYLENE (BOPP) FILMS "F L E X O P P"
Film Business at Uflex produces over 68,000 TPA of BOPP films on its three State-of-the-art lines. These films come in the thickness range of 8 – 75 microns and are available in plain, heat-sealable, metallisable, matte, pearlised, cavitated, overwrap, white opaque and speciality film grades variety. Down-gauged Conversion Substrates: We have developed world’s first 8 micron plain/ heat-sealable BOPP films. We have also developed heat-sealable 12 micron metalized BOPP films that are suitable for printing and lamination. These run at the same speeds during conversion as conventional higher thickness films and provide significant source reduction ranging from 33% to 47%. They have much lower carbon footprint than the films they replace. 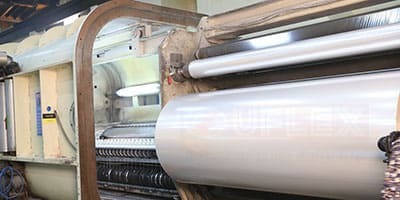 High Coefficient of Friction (COF) BOPP Films: The film surface is modified to deliver a high COF to enable anti-slip and good stack-ability when used as the outside surface of Woven Polypropylene (WPP) bags and other bulk packs. The film surface can also be tailored to have very precise COF values with less than +, - 10% variation for superior and consistent performance on packaging machines. Low Seal Initiation Temperature (SIT) & High Seal Strength Matt Films: The matt film is designed with Low SIT (105 ̊C) ,high seal strength (>450 gm/25mm) with high haze (>70%), good contact clarity (gloss <8), excellent matt dispersion for growing bottom pinch jobs of PET Foods, Rice Bags etc. High COF Matt Films: This matt film is designed with excellent Antiskid properties (COF > 0.5) and having good contact clarity (Gloss < 10), excellent matt homogeneity. Because of good esthetic appeal combined with excellent antiskid properties, this film is more preferred for bulk bag applications for PET Foods & Rice Bags. Bio & Oxo Degradable BOPP Films: To support our drives for sustainability, we have developed various grades of Bio & Oxo Degradable BOPP films. Anti-fog BOPP Films: Fog formation inside the sealed transparent packaging film because of the high amount of water in food causes poor visibility of the packed product and thus less attractive to potential buyer. Anti-fog BOPP films for both hot & cold applications don’t allow fog formation on film surface and hence we can achieve clear visibility of packed products. These are largely used for fresh vegetables & chicken bags. CAST POLYPROPYLENE (CPP) FILMS "F L E X C P P"
Film Business of Uflex produces over 17,000 TPA of CPP films which can be supplied in widths up to 3000m. These films come in thickness range of 18 – 200 microns and can be offered with corona treatment on one or both sides.These films are available in plain, heat-sealable, metallisable, polished, mirror finish, embossed surface, glossy/ matte finish, high stiffness, flexible, clear and opaque varieties. Retortable CPP Films: This film is designed with excellent impact & high seal strength and can withstand high retort conditions (135 ̊ C for 30 min). It can be used towards direct contact with foods. This variant withstands retort processing. Peelable CPP Films: This film is functionally modified CPP film with consistent peel & seal performance with PP substrate and is used for lidding in both sterilisable & non streilisable applications. Bread Packaging CPP Films: This film is designed with optimum combination of optical, frictional, impact & sealing properties to use as a single substrate (printed) for high speed bread packaging machines. Anti-fog CPP Films: Fog formation inside the sealed transparent packaging film because of the high amount of water in food causes poor visibility of the packed product and thus appear less attractive to potential buyer. Anti-fog CPP films for both hot & cold applications don’t allow fog formation on film surface and hence we can get clear visibility of packed products. This variant is largely used for heavy duty fresh vegetables & chicken bags. METALLISED BOPP, BOPET & CPP Films "F L E X M E T P R O T E C T"
With its fourteen State-of-the-art metallizers with plasma treatment facilities for better metal to film adhesion and superior metal coverage, Film Business of Uflex produces over 45,000 TPA (100 million lbs) of High Barrier Metalized films per annum with optical density ranging from 0.4 to 3.5 in widths up to 2,850 mm. These films come in the thickness range 6.5 – 75 microns for BOPET; 8 – 75 microns for BOPP and 18-200 microns for CPP. Special Effects Films are a range of films that have been embellished with special optical effects. The films are especially processed to get special optical effects, customized patterns and proprietary designs on their surface. These can also be metalized and/ or printed to further enhance appearance. AlOx coating is the application of a thin and highly transparent aluminium oxide on packaging films that imparts high moisture and gas barrier properties giving a tough fight to aluminium foils and metalized films. It is the only true high-barrier flexible packaging material available, that is transparent and allows packaged product to be clearly visible. AlOx coating is a cutting edge technology that only a very select/ handful of film manufacturers are equipped with.